ARRINGTON DE DIONYSO: CAPSULE REVIEW! With their bright and attention grabbing colors, Arrington de Dionyso’s paintings command the room and demand full attention. His largest, and most populated painting, Untitled II, depicts a Hieronymus Bosch like gathering of fantastical looking humans and animals. 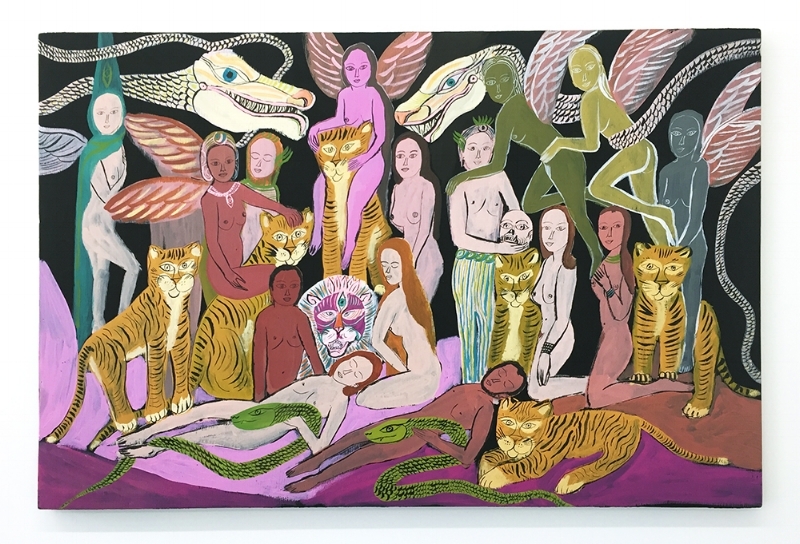 Each of the elements in this painting have an extra-ordinary quality to it; a woman with wings sits casually on the shoulders of a tiger, snakes slither through the limbs of several sleeping humans and dragon-like winged reptiles fly through the jet black background. Though the clash of human and animal is often one depicted as one ending in violence, de Dionyso reverses this narrative to create something that is much more calm and serene. The figures in his scene are coexisting together; they have learned to create a community where, despite their obvious differences, man and creature can cohabitate within the same space.